With the advent of neo-adjuvant therapies for diseases such as pancreatic cancer, most patients require a tissue diagnosis before initiating treatment. Endoscopic ultrasound-guided fine needle aspiration (EUS-FNA) and fine needle biopsy (FNB) have evolved to become indispensable diagnostic sampling tools in patients with gastrointestinal tumors. This web page includes physician lectures, case studies, best practice procedural and sampling techniques for EUS-FNA and EUS-FNB. Dr. Sahai shares his diagnostic EUS techniques and navigates recently published data on FNA and FNB. 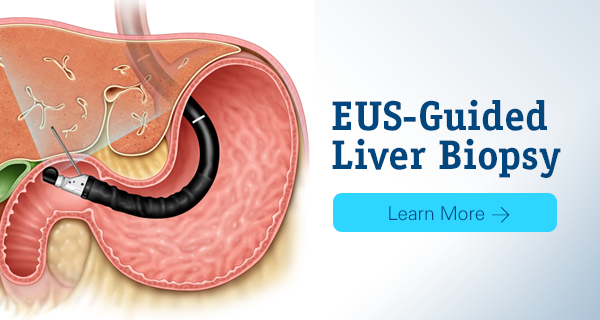 A 3-part presentation on EUS-guided liver biopsy: Why and How, Patient Selection and Technique, Literature Review, Case Study and Treatment Algorithm, Drs. Amit Singh Johal, Harshit Khara and David Diehl, Geisinger Medical Center, Danville, PA, U.S.A.
Shantel Hebert-Magee, MD gives the viewer an overview of pathology. Watch our evening with the experts, opinions on the frontiers of EUS as they relate to tissue acquisition in diagnostics and oncology research. Moderated by Shyam Varadarajulu, MD interviewing panelists Ann Chen, MD and Bill Brugge, MD. Dr. Shyam Varadarajulu provides instruction and best practices for performing EUS-FNA on a lesion in the body or tail of the pancreas using the Expect Ultrasound Needle. Dr. Shyam Varadarajulu demonstrates his technique for examining the pancreas tip to tail and identifying anatomy landmarks on the ultrasound image. Dr. Shyam Vardarajulu demonstrates the fanning technique when performing EUS FNA on a pancreatic mass. Dr. Sahai shares his tips and tricks for FNB as he performs a biopsy of a pancreatic mass. The case also features on-site pathology confirming the diagnosis. Dr. Al-Haddad presents an overview of clinical data comparing FNB and FNA. He also shares his FNB best practices and a case study based on his experience. A case report using the AcquireTM EUS-FNB Device, presented by Dr. Jorge Obando. Using a 19ga Endoscopic Ultrasound Fine Needle Biopsy Device to Perform a Liver Biopsy Presented by Matthew M. Eves, M.D. Thomas Hospital Infirmary Health, Fairhope, Alabama, U.S.A.